Keeping exciting news under wraps for 2 years has been hard work to say the least, but finally we can talk freely about our work with Disney's Alice Through The Looking Glass. To our surprise back in 2014 we were asked to prototype an antique mirror finish for an undisclosed Disney film. Once the right finish had been perfected we were asked to produce 5 large antique mirrors for a mysterious production company at Shepperton Studios. When the contract arrived we found out that it was to be used as the main mirror prop in Disney’s Alice Through The Looking Glass! We could tell no-one, not even our children! 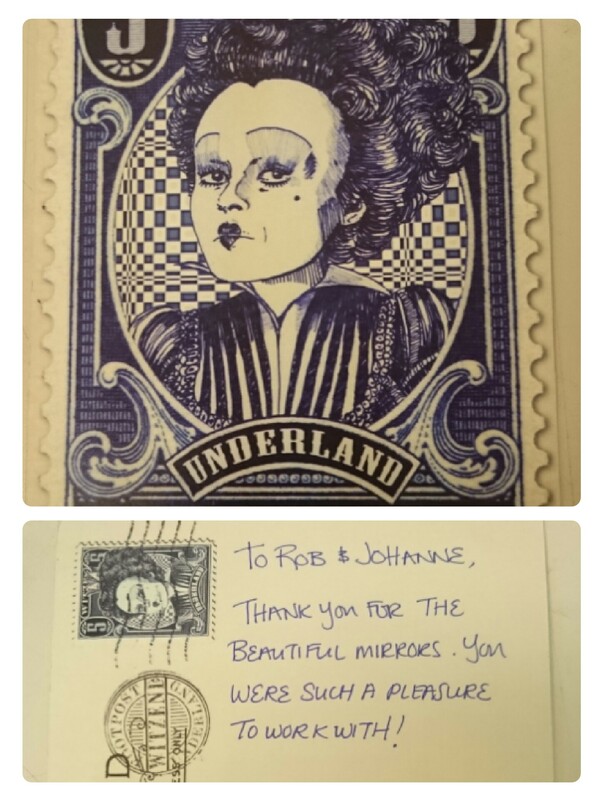 When we had finished the commission, were sent an official postcard from the set design crew thanking us for the mirrors. Over the course of the 2 years we kept a look out for the any promotional info about the film. Then in the autumn of 2015 the 1st trailer broke and we couldn’t believe it, there was our mirror centre stage with Alice climbing through it into Underland. I just wish our mirrors were a portal to another dimension, we could certainly sell mirrors that could do that!